Designed By Phil With The Versatility For Any Wedge Shot. For the Mack Daddy PM-Grind Wedge, Phil Mickelson worked directly with Roger Cleveland on the shape and larger groove area so you can take on the toughest short game shots. 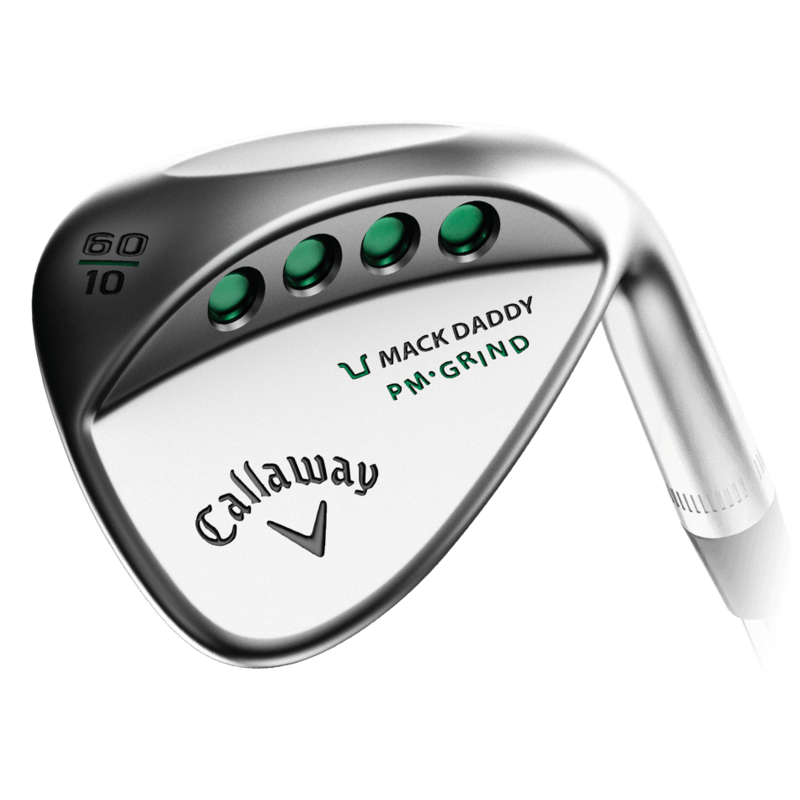 Mack Daddy PM-Grind Chrome Wedges is rated 4.8 out of 5 by 166. Rated 5 out of 5 by Angus from Mack Daddy PM - Grind Chrome Wedge - Great Wedge. Our golf course has tight lies in the fairway and short Florida rough. I purchased the Mack Daddy with PM grind 58 degrees with 10 bounce. I play it from the middle of my stance with no forward press and it puts the ball in the air quickly for shorter shots. It sets up flat on the fairway. I play it with some forward press and a fuller swing for more distance. I like the heavier feel of this club versus the Vokey wedge that it replaced. I purchased it on line at Callaway Preowned and it arrived in mint condition, not a scratch on it. Rated 5 out of 5 by Seaport1 from Love this Wedge For me, the large head gives me great confidence when hitting those difficult sand shots. From the fairway, I can make this wedge stop on a dime. I Plan on adding a 60 degree in the near future. Rated 5 out of 5 by rainmaker from unique wedge This wedge is breeze to play with an open face (something I'd always struggled with), which means you can get by with fewer higher loft wedges. And it's great from the rough and sand too. The rounded leading edge plays an important role, which also makes it just a bit harder to hit full. Rated 5 out of 5 by EV from Very versatile Looks a little funky. Has the look of an old Ping Eye wedge, but performs fantastic. Lots of spin on approach shots and easy to control around the greens. Great all around weapon. Rated 5 out of 5 by Woody from Great from fairway and sand This 60* wedge has been easy to control distance and has plenty of bite! Rated 5 out of 5 by PJM from GREAT 60* LOB WEDGE !!! BUT ??? This 60* LOB WEDGE is truly a GREAT Wedge, But just TOO MUCH BOUNCE for Tight-Lies !!! I've used this wedge for over a Year now and I really do like it, but 10* Bounce is way to much !!! I have to be sitting with the ball up in-order to be able to hit it clean every time. On a Tight-Lie you just may blade it !!! It just has too much Bounce Again !!! I may take (grind) off some of the Bounce and add some lead-tape to the back of the face to make up the change in weight. BUT other than that It's a VERY GOOD WEDGE !!! Rated 5 out of 5 by HackerD from Great wedge (PM grind lob wedge) I use this wedge for what it's good for. Short game shots near the green, especially from rough or sand. I've hit some nice recovery shots from thick lies in the rough next to the green. It's more challenging from a tight lie, but open the face and it's good for those too. Have to overcome the fear of the skulled shot. I don't really ever use it for full swing from the fairway.